In my previous post I mentioned seeing Shelduck on the Conwy Estuary and thought I’d put in a bit more about this very handsome species that will also give me an excuse to use some photographs from my archives. 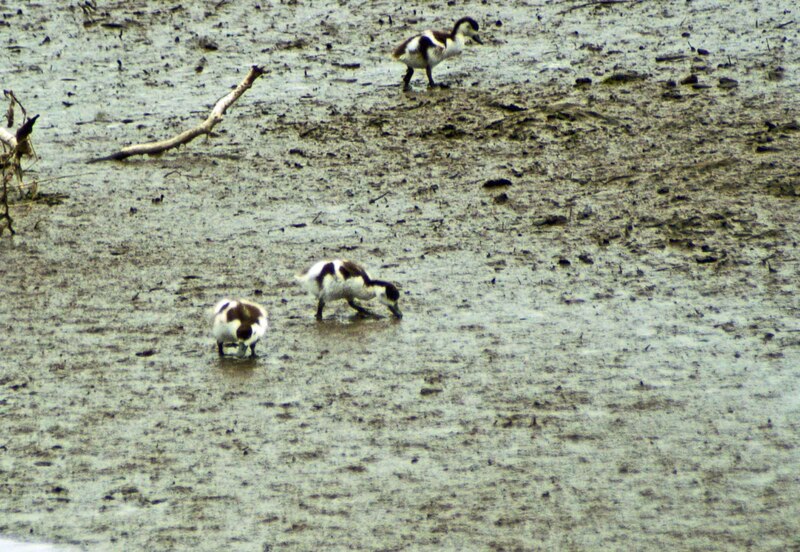 I have taken most of the photographs in West Wales at the Nevern Estuary where good numbers of pairs of Shelduck have been recorded, with several pairs breeding. Other sightings in the area have been made in Ceibwr Bay and on the amazing Skomer Island. The Shelduck (Tadorna tadorna) is a sea duck that is slightly larger than most other ducks, indeed the species is sometimes thought of as an intermediate between ducks and geese. They were originally known as “sheldrakes”, and this remained the most common name until the late 19th century. 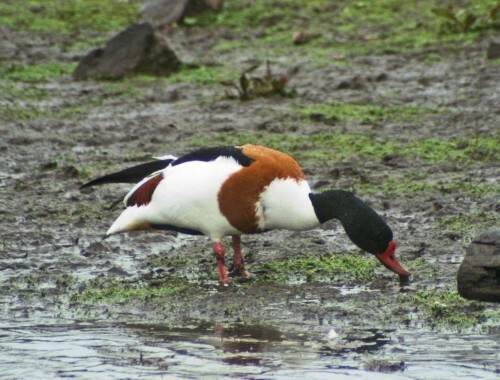 The word is still sometimes used to refer to a male shelduck. The genus name Tadorna comes from Celtic roots and means “pied waterfowl”, essentially the same as the English “shelduck”. The colouring of common shelducks is quite distinctive. They are mainly white, with a dark head and neck, red bill, and other dark or reddy brown patches down their body. Adults also possess an orange or reddy brown band around their chest, which is absent in juveniles. Their diet comprises mainly small shellfish, water snails and other small invertebrates. The ducks are not natural divers but will do so to avoid predators. 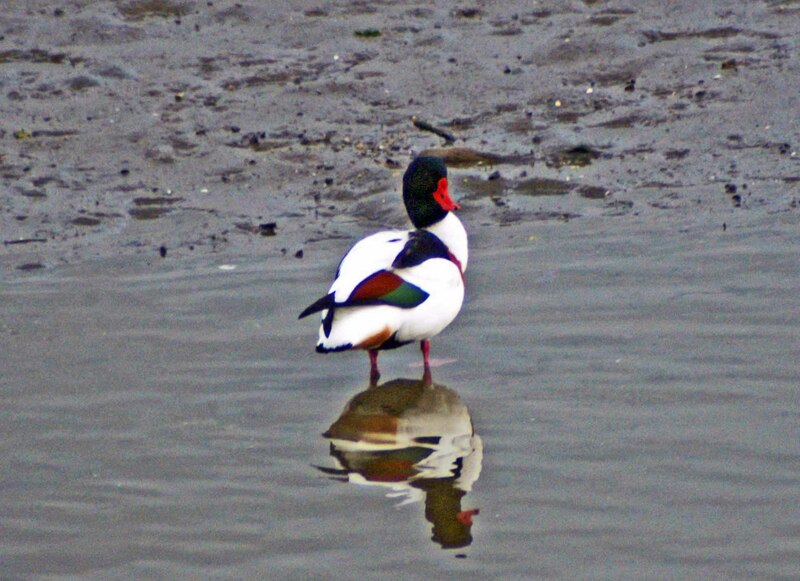 Shelducks are migratory birds and arrive at their breeding grounds in late winter or early spring. The Royal Society for the Protection of Birds (RSPB) have given the common shelduck an amber status for conservation purposes based on the historic population of ducks having fallen, although there has been some recovery in recent years. At a global level they are not considered to be at risk as in Europe alone there are perhaps as many as 56,000 breeding pairs. It is estimated that approx. 11,000 pairs of birds breed in the UK. They choose a variety of nest locations including disused rabbit burrows, haystacks and holes in trees. In 2008, during the last week of June and the first week of July I was staying in Pembrokeshire where my friend has a house near to the lovely village of Nevern. Every day we made a stop on the bridge over the estuary which carries the road into, or out of, the village of Newport. 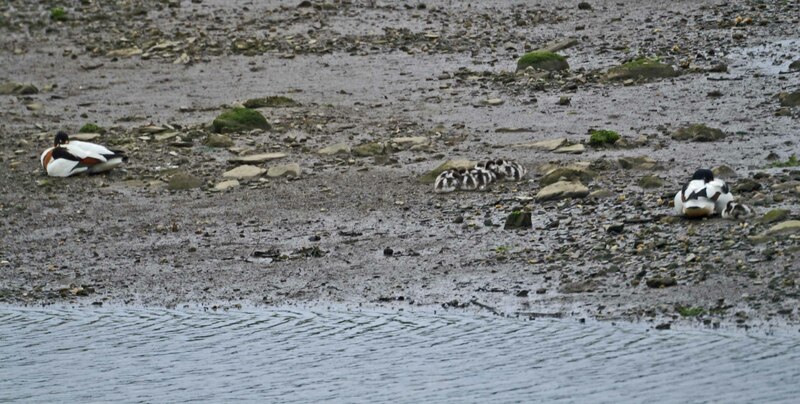 There is almost always something of interest to be seen from here, but we were especially charmed by the Shelducks and four ducklings that we saw most mornings and evenings. Perfectly camouflaged against the brown mud and gravel of the river bottom the youngsters skittered about all over the place under the watchful eyes of the adults. 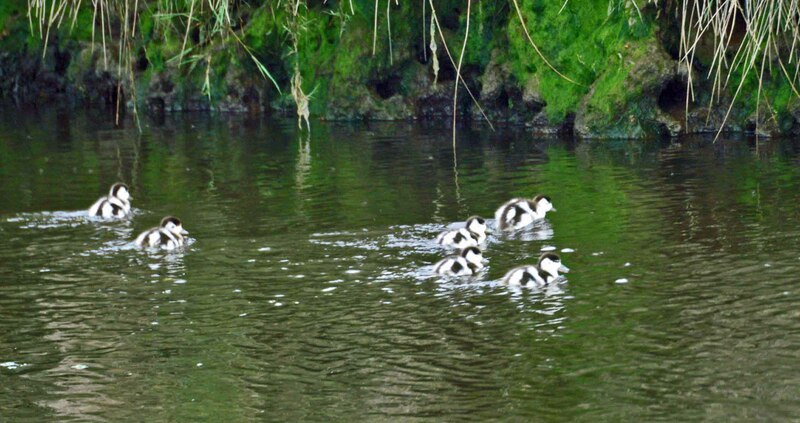 A couple of years later, slightly earlier in June (2010) we discovered there were two adult Shelducks in charge of no less than thirteen tiny ducklings. We were well aware of the hard fact that the cute fluffy little things would make a tasty snack for a number of potential predators, so each time we stopped on the bridge we tried to locate them and counted them anxiously. Luckily for our sentimental selves the little gang remained intact until the day of our departure. We were surprised by the number of ducklings this year, assuming them to be from one family, but later learned that once breeding is underway the ducklings are left in creches, with large numbers being cared for by one or two female birds, while the rest migrate to their moulting grounds. 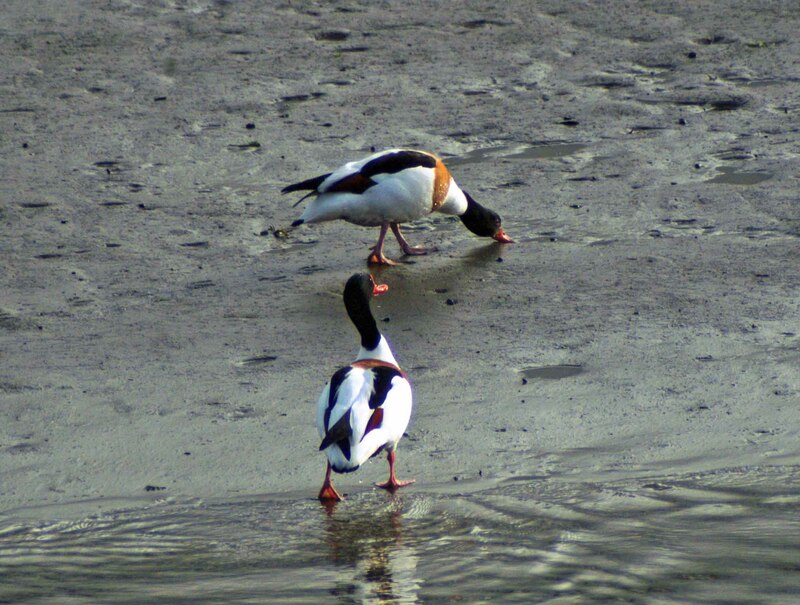 Shelducks are found in the UK all year round, mainly in coastal areas, though they can also be found around inland waters such as reservoirs and gravel workings. Sorry, I haven’t been present for your last few posts. I did read through them. You must always have a camera with you, as you drive what sounds like a glorious drive to work in the morning. I particularly liked your photos and discussion of the Shelducks. They are absolutely beautiful. I’ve never seen a duck in the midwest so colorful! They seem to strut with elegance — at least your photos capture them so elegantly.